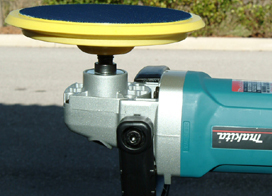 A molded urethane backing plate for excellent flexibility and balance. If German carmakers think this backing plate is good enough to use on their top-of-the-line vehicles, you can bet it is the best plate you can buy for your vehicle. BMW and Mercedes-Benz both hail these backing plates as the best because of the outstanding properties of molded urethane. This Flexible Backing Plates minimize heat transfer, flexes to hug your vehicle’s curves, and are built to last. And they are the best backing plates you can buy for your Rotary Polisher. The Flexible Backing Plate LC-43-175 measures 7” and is perfect for the Curved Edge 8.5" Foam Pads and 8 inch pads. Fits all rotary buffers with 5/8" diameter shaft. Use the backing plate preferred by some of the leading car manufacturers in the world to put the final touches on their vehicles. 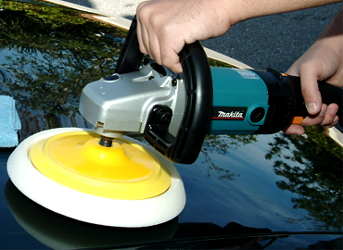 Our Flexible Backing Plate provides the safest, most durable surface for your pads so that you get the best performance possible from your polisher. Seems to be as good as a 3-m but cost far less.